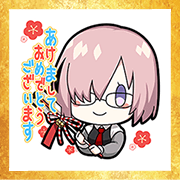 The development team behind "Fate/Grand Order" brings you these new FGO New Year’s Fortune (Omikuji) stickers. Ring in 2019 with some of your favorite Servants! Omikuji lasts from December 27, 2018 to January 3, 2019.